by Cleo Coyle | Mystery & Thrillers | This book has not been rated. 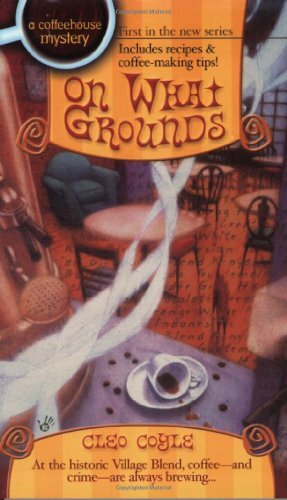 This is the first Clare Cosi Coffeehouse Mystery. Includes recipes and coffee-making tips. "The perfect cup of coffee is a mystifying thing. To many of my customers, the entire process seems like some sort of alchemy they dare not try at home...." Ten years ago, Clare Cosi left an unhappy marriage along with a job she loved: managing the historic Village Blend coffeehouse in New York's Greenwich Village. For a decade, she was happy raising her daughter in the quiet suburbs of New Jersey; but now that Joy is grown and gone, life has gotten way too quiet for Clare. With a little cajoling from Madame, the Blend's flamboyant, elderly owner, Clare agrees to return to her old job, and right from the start she gets one heck of a jolt. On her first morning back as Village Blend manager, Clare unlocks the front door to find her beautiful, young assistant manager unconscious in the back of the store, coffee grounds strewn everywhere. As Anabelle is rushed to the hospital, police arrive to investigate, but Detective Mike Quinn finds no sign of forced entry or foul play, and he deems it an accident. Clare disagrees; and after Quinn leaves, there are a few questions she just can't get out of her mind, like why was the trash bin in the wrong place? If this wasn't an accident, are her other baristas in danger? And are all NYPD detectives this attractive? This was a good one! Will reserve for my Coffee, Tea, and Dessert virtual Bookbox. This book is on its way to Annimanni, who chose it out of the VBB, Coffee, Tea and Dessert. It has been mailed by surface mail which could take up to two and a half months. Enjoy! On the recycling shelf. Enjoy!